Recent findings have shown that around 1 in 6 Turkish properties sold to foreign buyers were bought by Brits in the last two months. The Land Registry Directorate General’s most recent statics highlight that 113,687 properties across Turkey are now owned by foreigners, an increase of 2,487 property sales made on September’s 111,200 figures. Further data shows that Brits are still the biggest foreign buyers of Turkish property, with 25,177 properties now owned by British citizens, an increase of 329 since September 2011. Meanwhile, the value of homes in Turkey increased by an average of 0.81% last month compared to September according to the REIDIN.com monthly property index with economic powerhouse Istanbul topping the average figure, increasing by 0.88%. 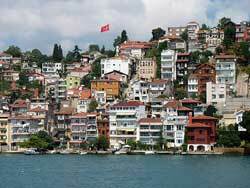 “Turkey has become an exceptionally popular property choice. At present it is an anchor of stability with a booming economy that is hoped to reach around $2 trillion by 2023, and with the predicted 2.9 million housing units required over the next four years to accommodate the ever growing population, we at Property Frontiers have recognised the flourishing potential of Turkey as a lucrative property investment hub," Ray Withers, Director of Turkish property investment experts, Property Frontiers, says. He notes that indeed, Istanbul, has experienced an increase in rental values therefore creating one of the best areas for rental opportunities. "The western suburbs located around Ataturk International airport such as Beylikduzu, one of the fastest growing areas, presents not only a great opportunity for investment but cheaper property price tags than the rest of Europe, making the city even more attractive to potential buy to let investors wanting to take advantage of the increase in rental prices highlighted by the data,” Mr. Withers adds.